The Magnum Outdoor Cuisine Lii Knife is a kitchen knife that functions just as well inside as outside. The Japanese Nakiri style blade is this enough to cut through vegetables and boneless food swiftly without dragging on other sides of the food. This makes it good at quickly chopping up prepared food. 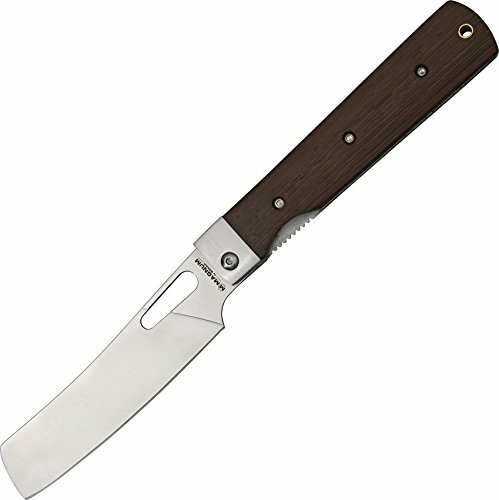 For hunters and campers on the go, this knife offers easy chopping in a sturdy frame. The 440 stainless steel keeps it durable and sharp, and the liner lock mechanism keeps your fingers safe while the knife is in use. A rosewood handles seals the deal as an attractive complement to this folding knife. The length of the blade is 4 3/4 inches. and the overall length is 10 1/4 inches. It weighs 6 ounces. Limited lifetime warranty. A chestnut tree is the world famous trademark of the Boker knife manufactory in Solingen, Germany. It represents innovative, high quality, exceptional knives, manufactured with pride, by hand, for over 145 years. Blade length: 4 3/4 inches. Overall length: 10 1/4 inches. Weight: 6 ounces.